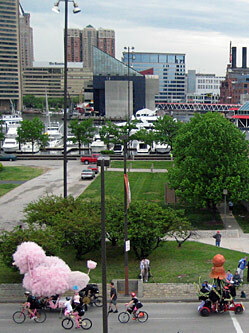 What a great day to be in Baltimore! 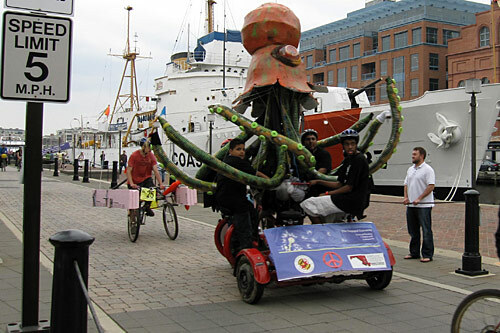 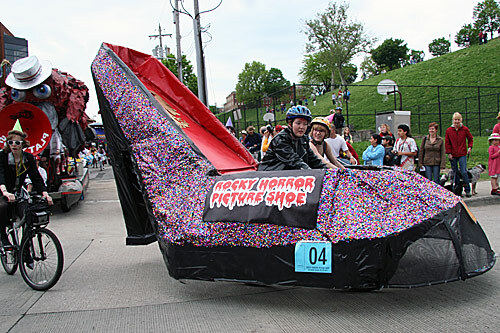 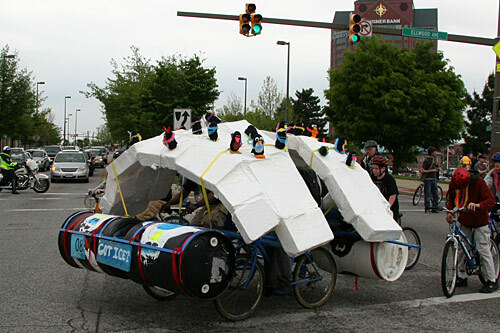 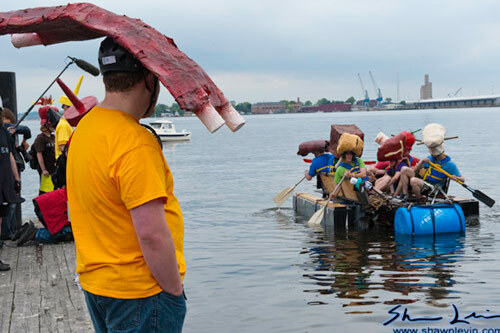 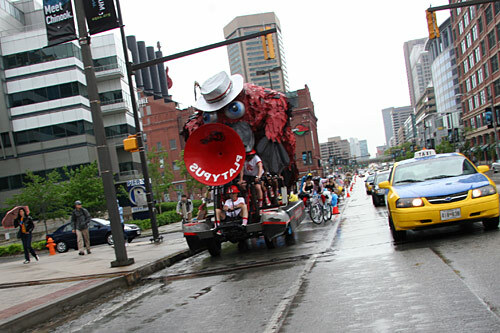 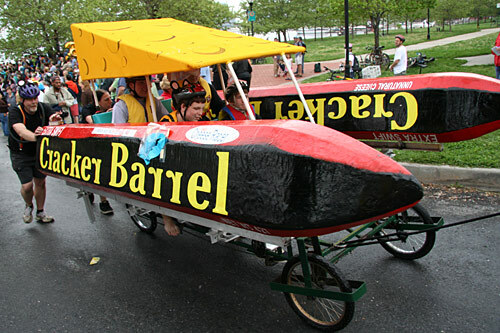 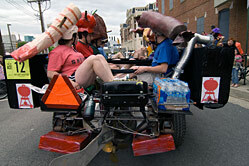 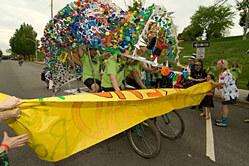 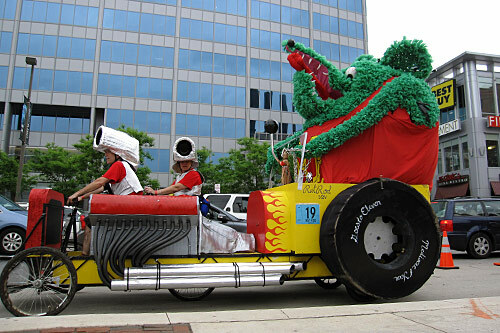 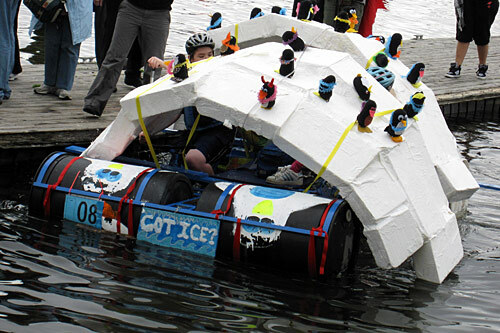 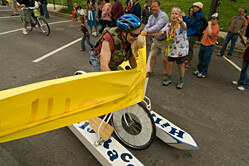 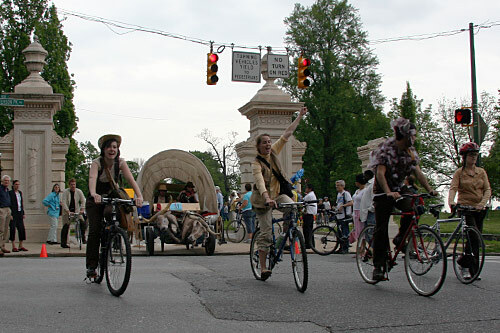 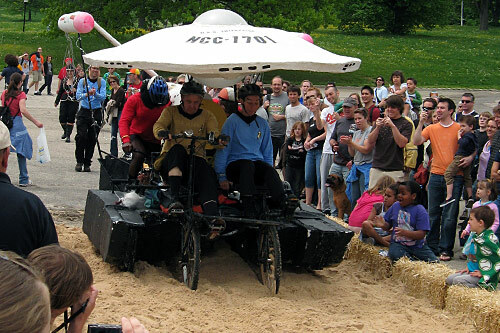 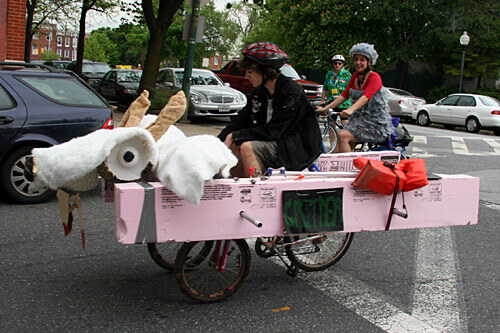 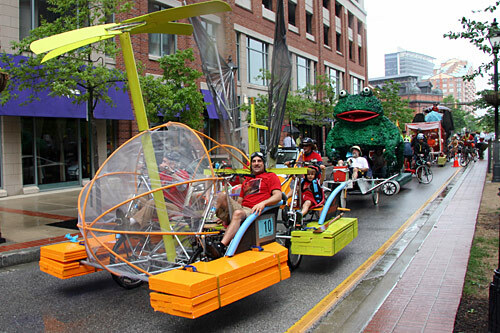 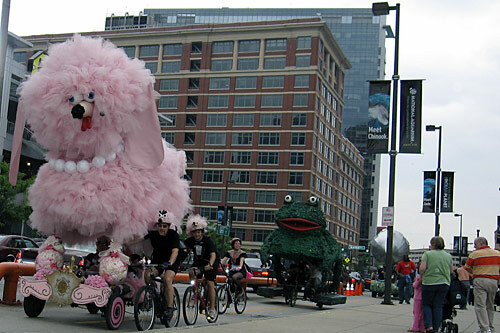 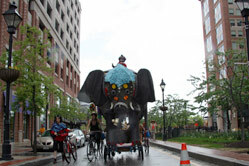 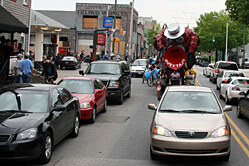 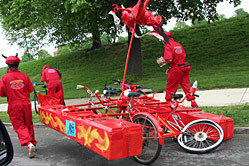 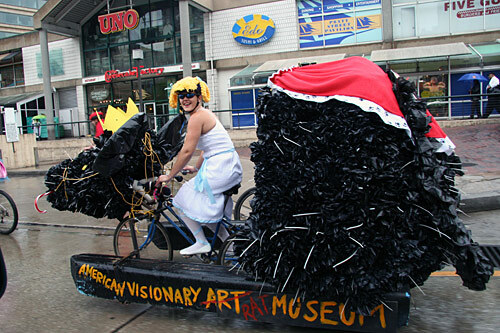 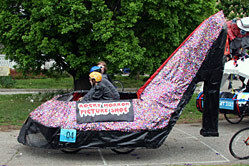 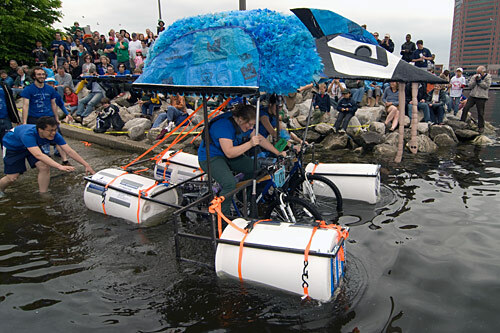 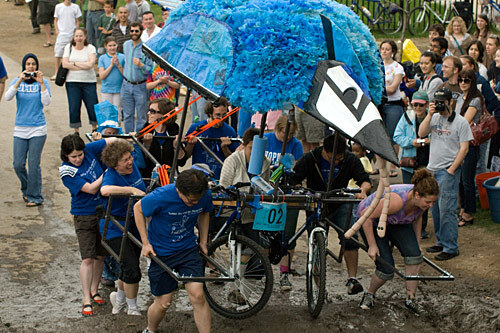 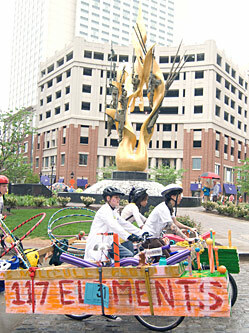 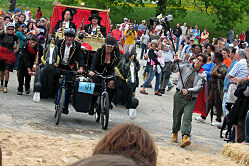 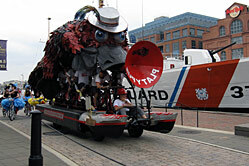 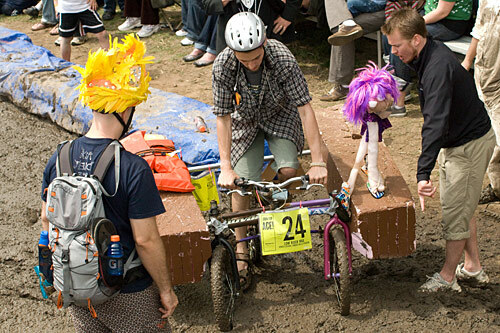 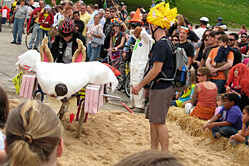 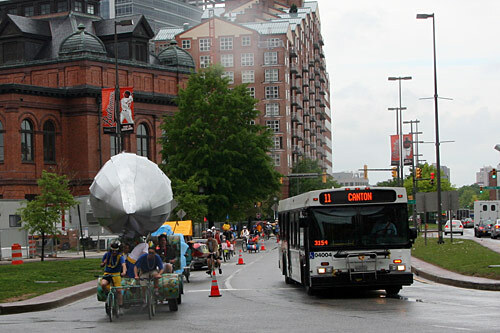 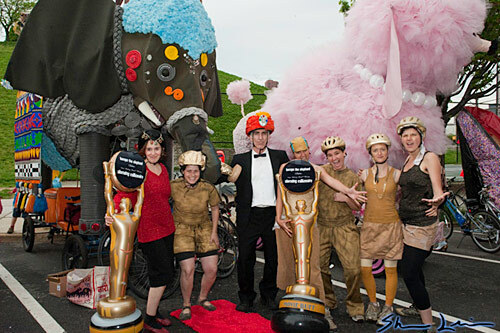 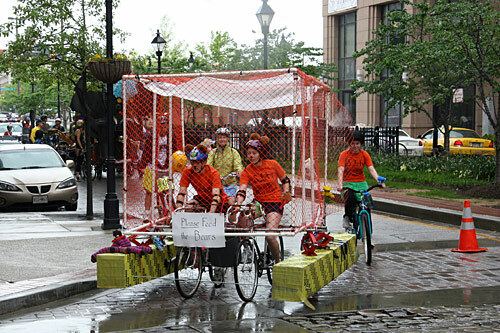 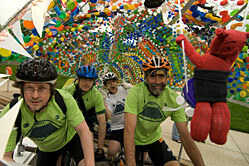 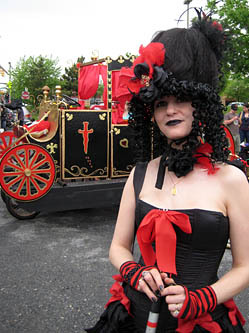 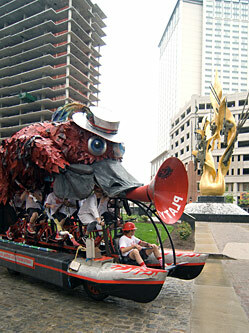 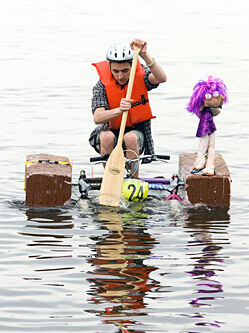 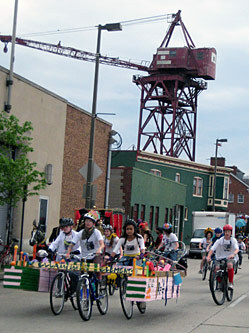 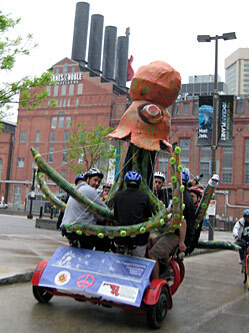 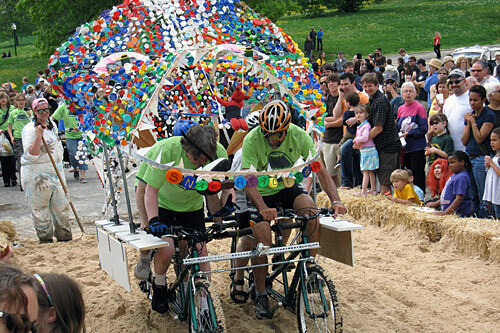 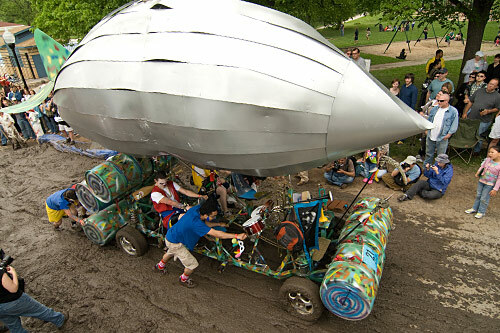 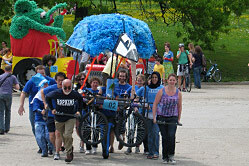 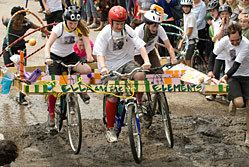 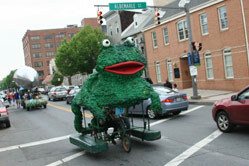 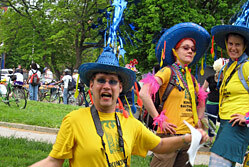 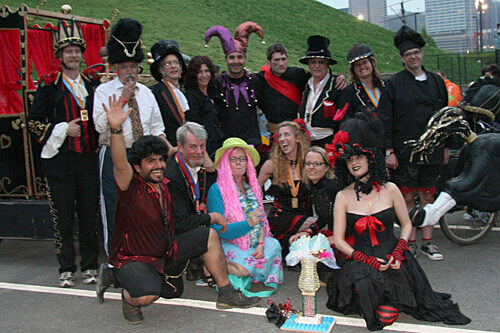 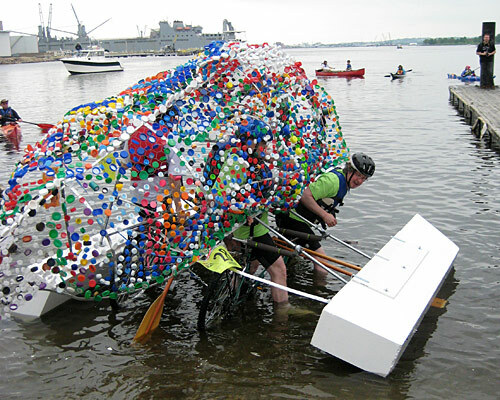 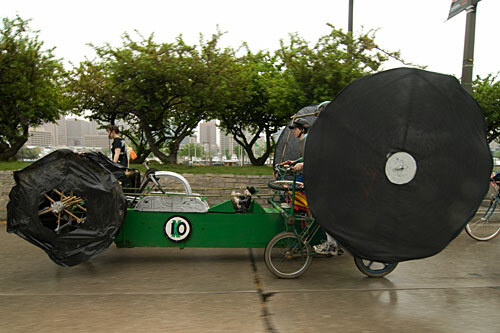 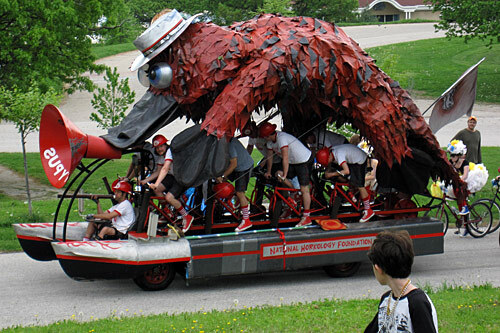 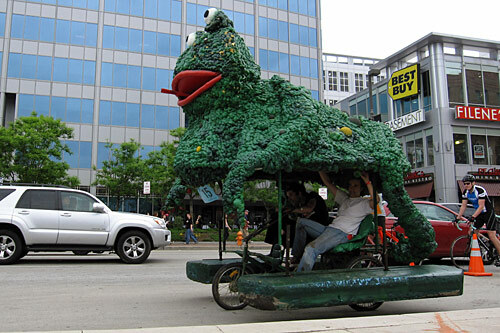 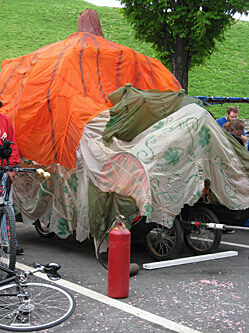 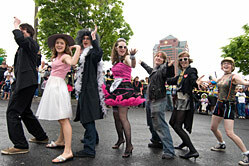 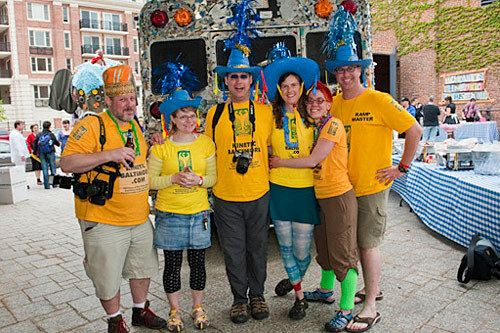 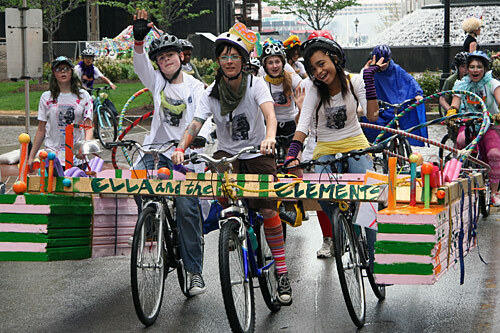 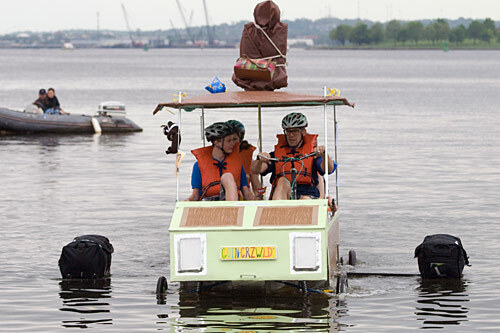 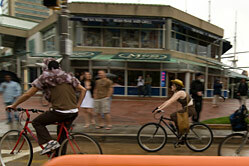 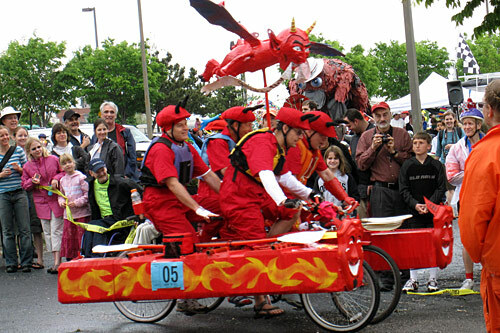 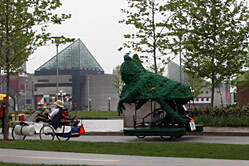 The eleventh annual East Coast Championship Kinetic Sculpture Race was a resounding success, with no shortage of spectacular sights, high-speed chases, and catastrophic breakdowns. 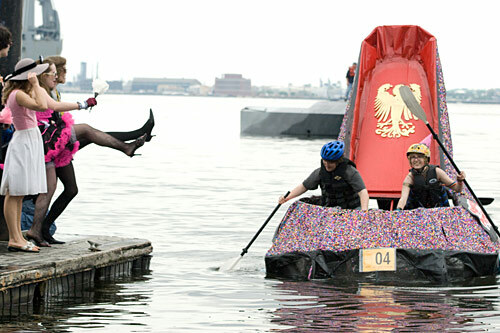 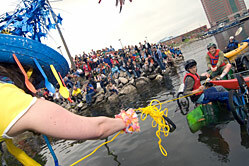 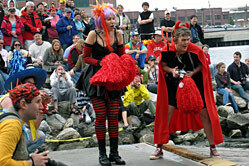 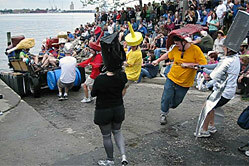 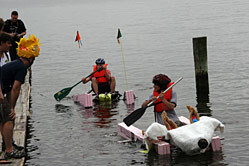 The Dumpster Divers provided drama at the water entry with a crowd-pleasing rolling capsize. 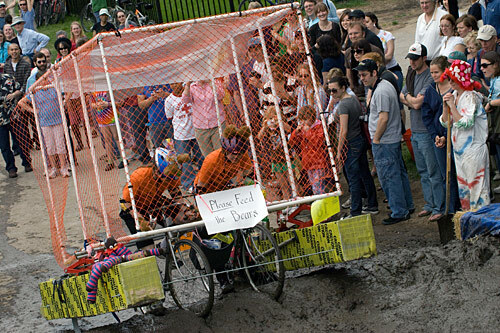 The Mud Doctor volunteers outdid themselves by creating the most challenging adhesive pit in Baltimore race history that sucked shoes off pit crew and stopped racers in their tracks. 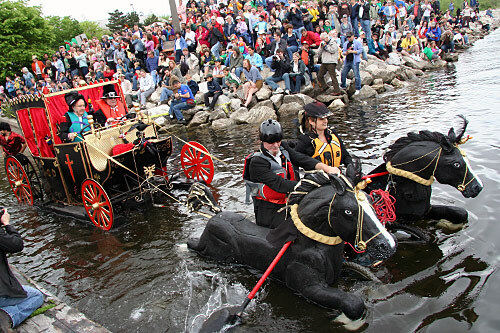 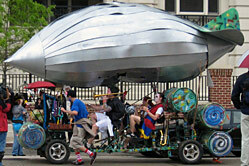 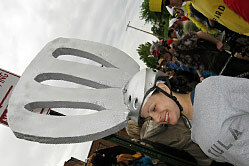 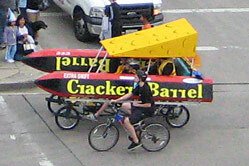 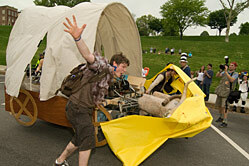 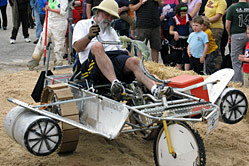 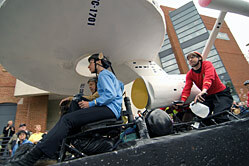 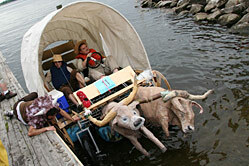 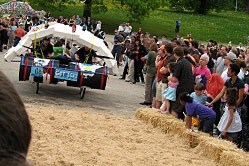 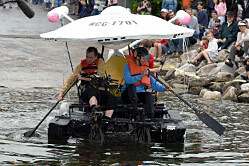 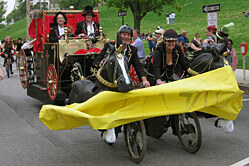 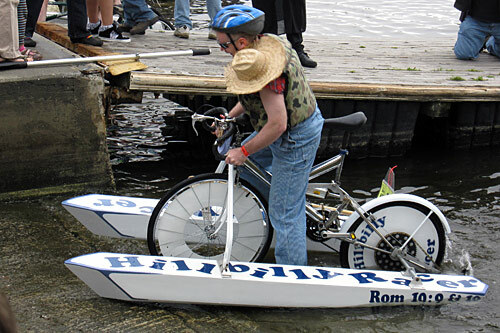 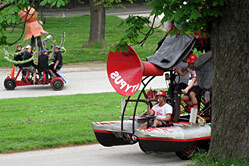 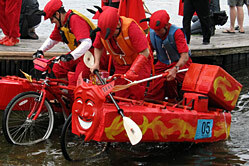 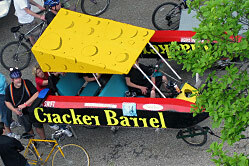 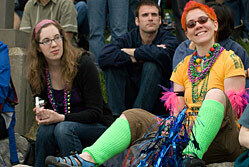 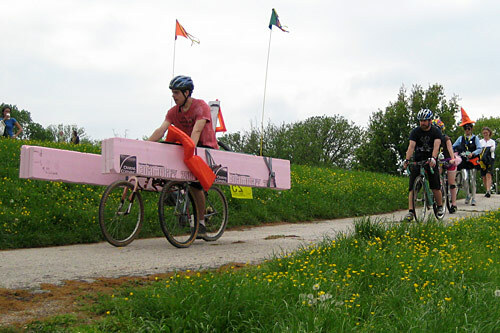 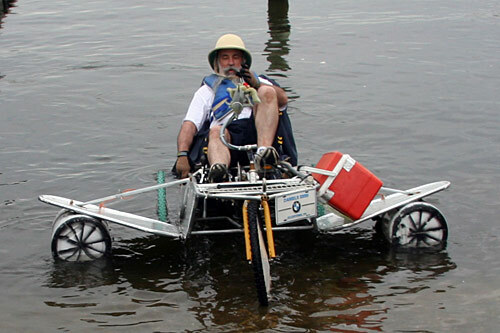 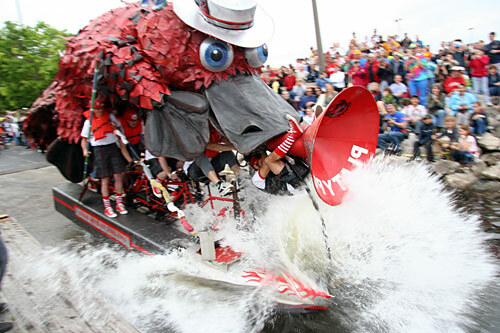 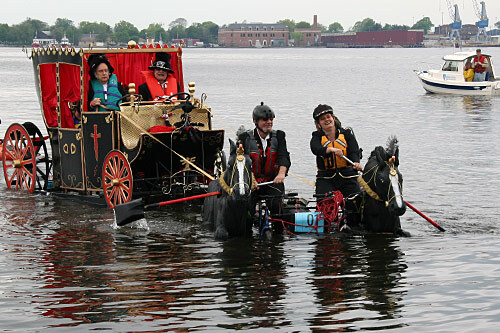 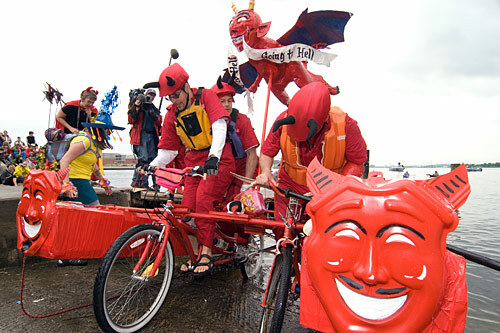 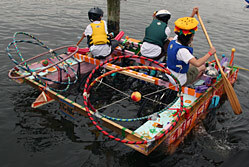 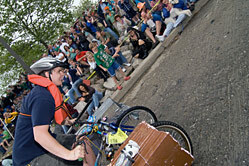 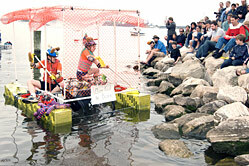 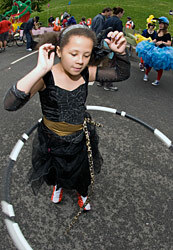 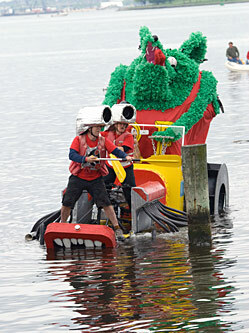 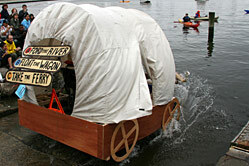 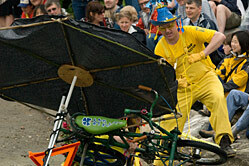 Spectators lined the streets of the 13-mile racecourse to see the amphibious human-powered works of art fly by. 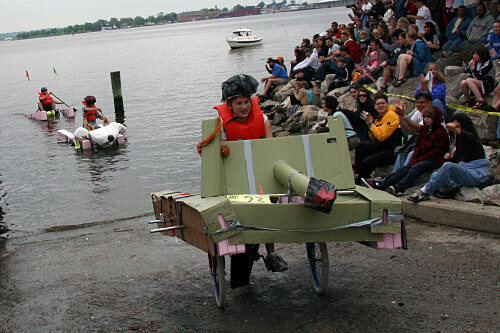 The winner of the eleventh annual Grand Mediocre East Coast Championship was Goin’ Griswold, based on National Lampoon’s Vacation. 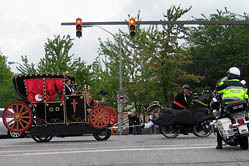 The Gottwald family of Great Falls, Virginia played the role of the Griswold family of suburban Chicago in their Wagon Queen Family Truckster heading for Wally World. 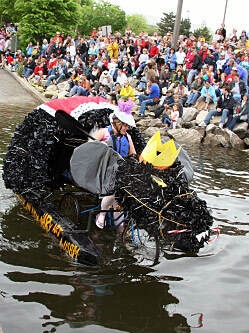 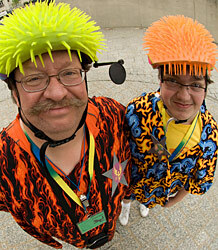 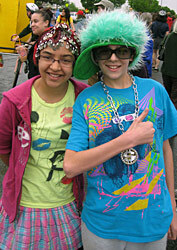 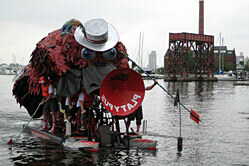 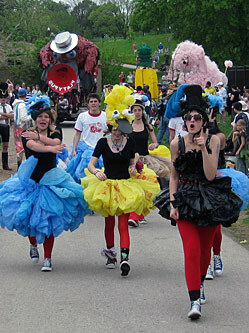 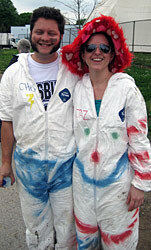 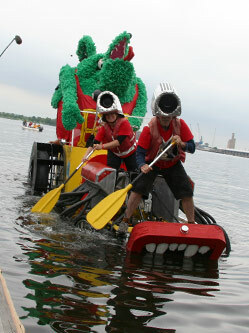 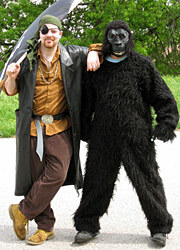 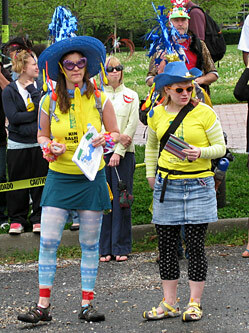 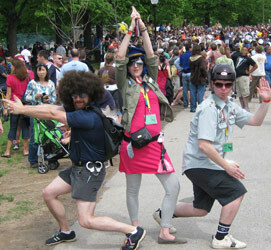 In last year’s race, the Gottwalds were the culprits behind Otter Chaos. 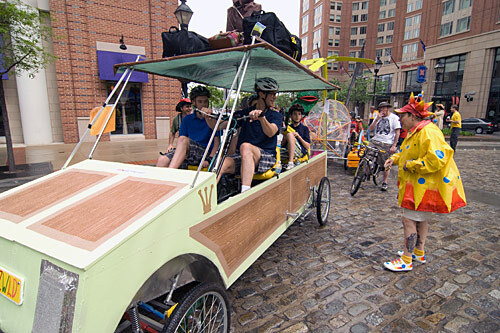 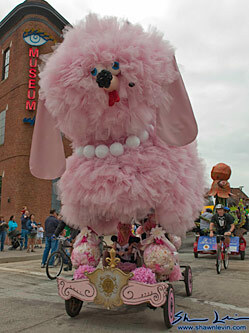 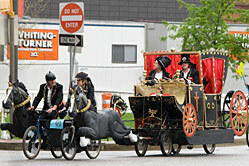 The first photo shows the Griswolds passing the kinetic checkpoint at Fells Point. 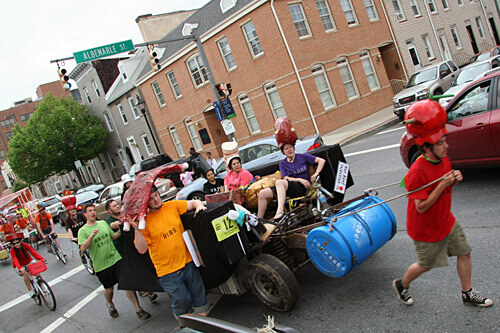 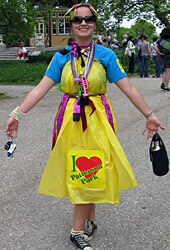 They carried the theme with luggage and Aunt Edna on the roof, affixing movie quotes as signs and bumper stickers, playing audio clips from the film, and wearing 1980s fashionable polo shirts and Madras shorts. 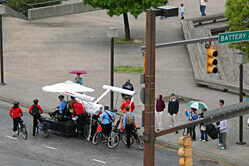 They received only one ticket from the Kinetic Kops, for carrying a corpse on the roof. 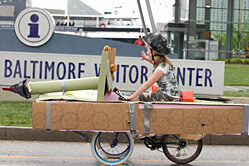 In contrast to the vehicle in the 1983 film, the kinetic vehicle was generally robust and sturdy. 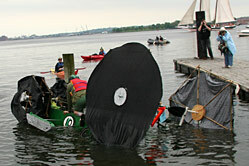 On the water, they used duffel bag pontoons for stability. 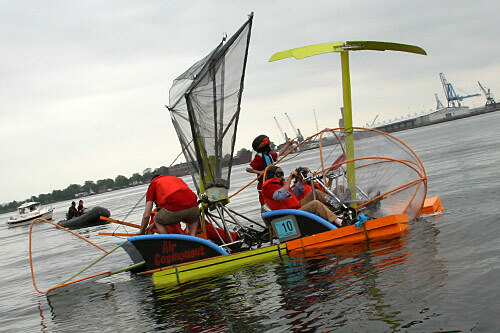 They applied to complete the race for the ACE award, following much more stringent engineering rules. 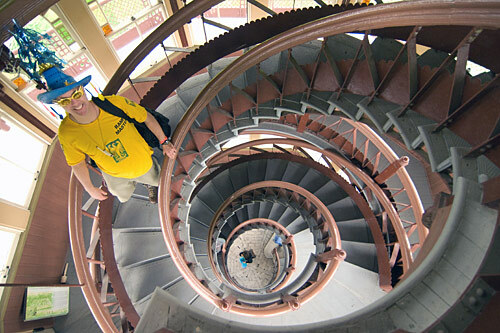 The steep and slippery water exit is the site of more sculptures losing their ACE status than any other. 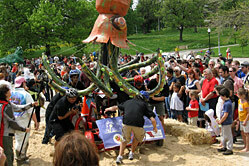 Mechanical stress there resulted in a drive train breakdown that was soon repaired but failed again in the sand, where they abandoned the quest for ACE. 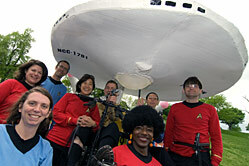 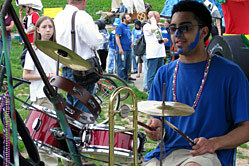 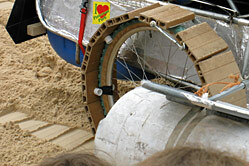 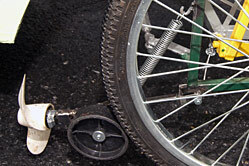 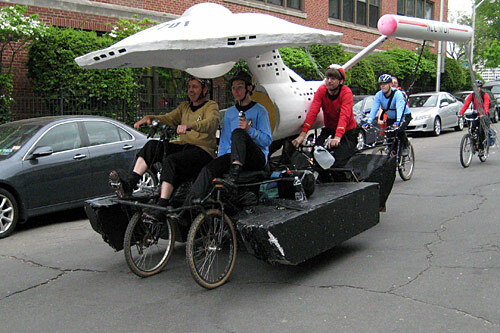 Small propellers near wheels are becoming more popular among Kinetic engineers in 2009. 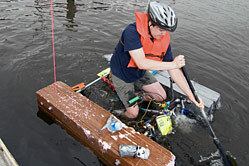 This is a fiendishly clever and simple method of water propulsion. 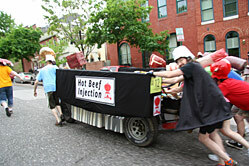 Baffling the Engineering judges with their simultaneous technical prowess and dramatic failures, Hot Beef Injection was an amphibious barbecue grill in which each pilot represented a chunk of food, and pit crew represented condiments and cooking implements. 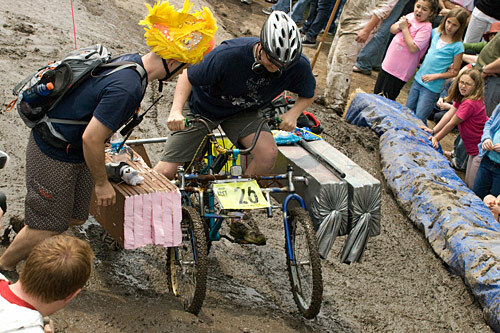 Adding to the festivity, they had an actual functional grill on board and served hot cooked food as bribes to race officials. 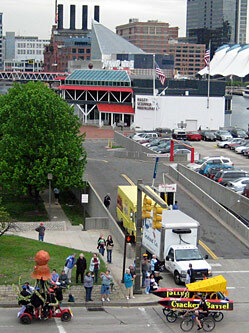 Spectators particularly enjoyed the sight of delectable food items navigating the Baltimore Harbor. 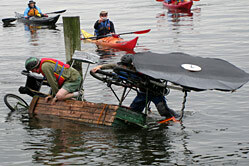 You can see the crew fatigue mounting as the afternoon wore on in the final photo below. 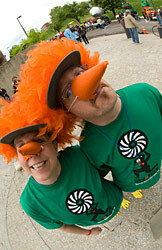 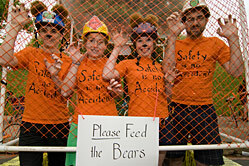 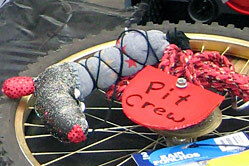 For their dogged determination to push their sculpture through the race, they received the Best Pit Crew as well. 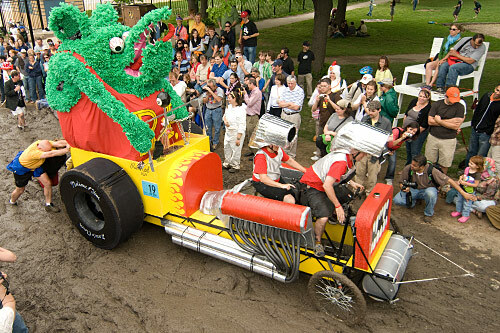 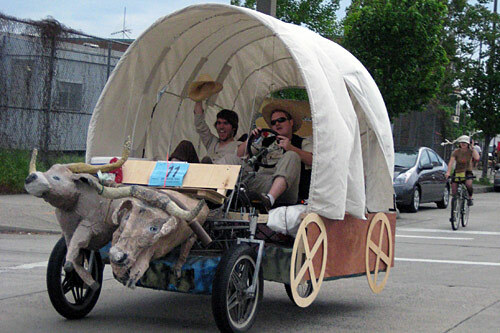 This is the same team that created 2008’s It’s Ben Hur, Hon and 2007’s Acme Kinetic Sculpture. 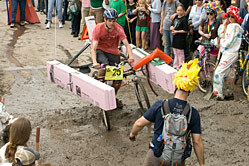 Water entry photo courtesy of Shawn Levin Photography. 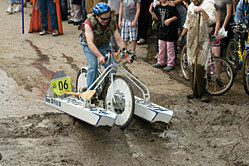 They also had a devilishly creative solution for real-wheel drive at the water exit. 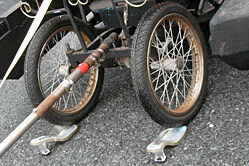 Rear-wheel-drive sculptures tend to have major difficulty because the flotation keeps the rear wheels from getting any traction. 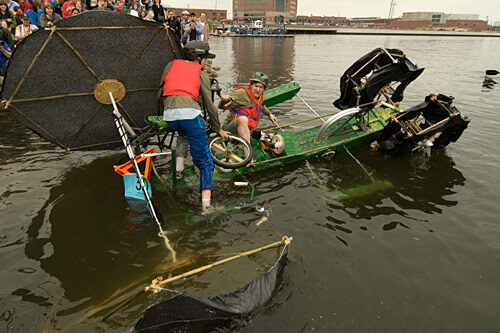 By hinging the aft ends of their pontoons, they were able to sink the rear wheels for effective aqueous egress. 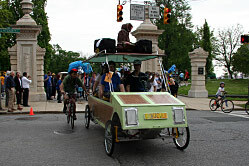 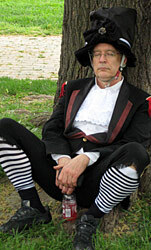 However, their engineering consisted principally of two tandem bicycles which seemed not quite up to the task; one of the wheels tacoed about 60% of the way through the racecourse as they approached Patterson Park, and they were unable to complete the race. 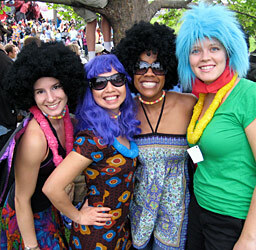 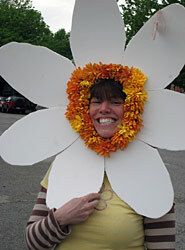 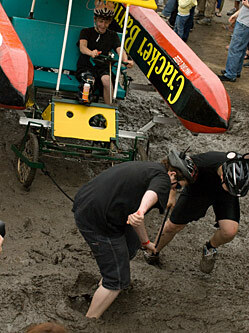 A very good first-year entry, and we hope they return in 2010! 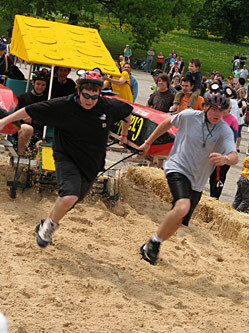 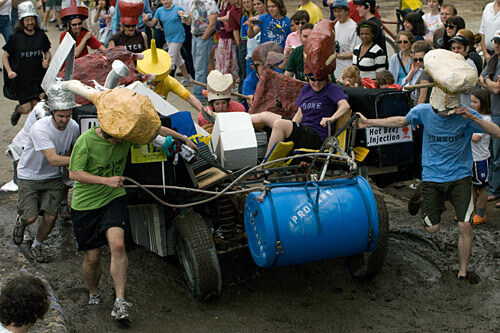 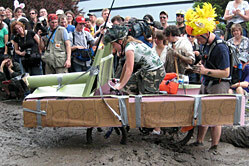 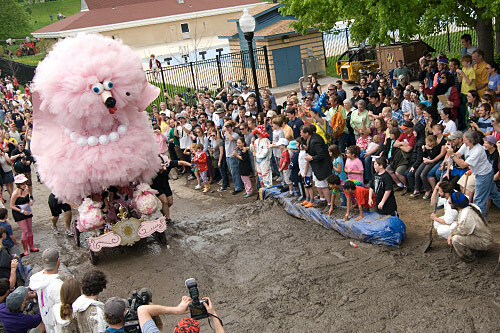 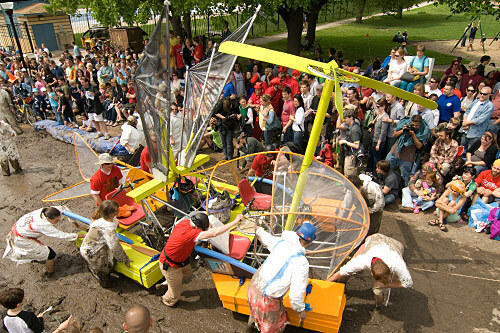 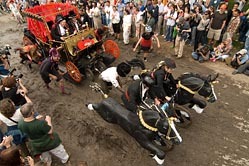 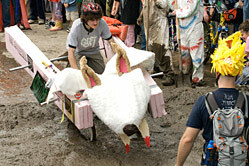 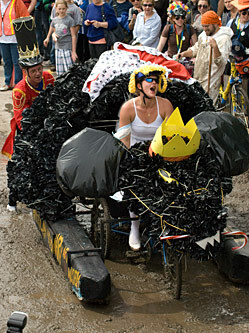 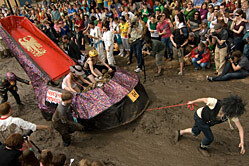 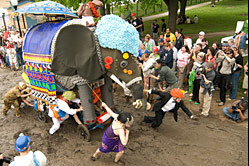 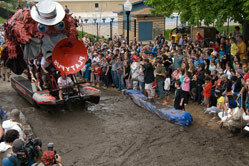 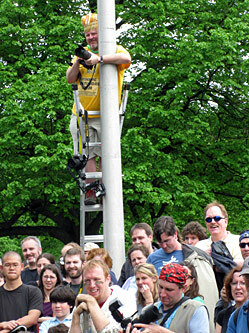 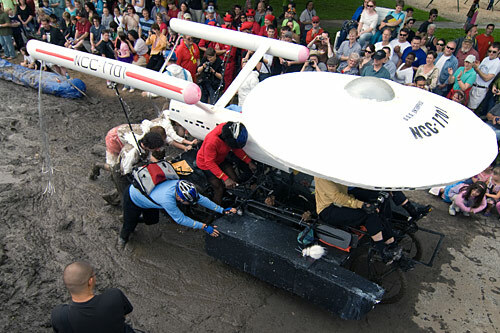 Looking extraordinarily similar in design to 2008’s Popemobile, the Safety Bears managed to climb the steep hump at the beginning of the mud pit without assistance. 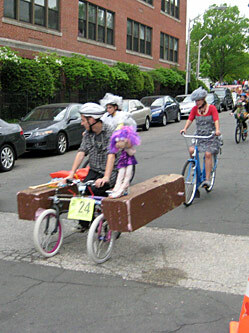 They tied with Fifi for the Best Bribes award because their assorted safety-related bribes impressed the judges.